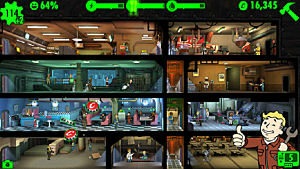 Fallout Shelter has received numerous updates since its release in 2015. In these updates, Bethesda has implemented new things to do and new ways to earn more of those caps that are essential to keeping your vault running. But no matter how many new ways there are to earn caps, one question always remains -- how do you earn them fast without using in-app purchases? In this guide, I'm going to go over some of the most effective strategies for farming caps and raking in as many as possible in a short amount of time. First things first, keep in mind that fast is subjective. Your idea of fast might be different from my idea of fast. Also when it comes to any resource farming games, there’s usually a set speed for everything. Selling excess weapons, armor, or junk gives you various amount of caps in exchange depending on the rarity of that item. Destroying rooms gives you some caps back, but only a portion for what you paid for that space. 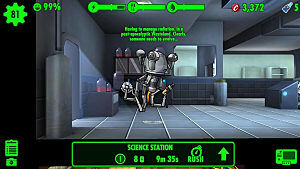 Rushing rooms gives a reward of caps but at the risk of creating an incident. 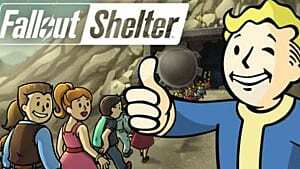 But there are some things to keep in mind when it comes to rushing rooms and sending dwellers out into the wasteland. Rushing Rooms to Farm Caps: Is It Worth It? I know the risk is 29%, but I still don't trust it. Rushing rooms isn't something I would recommend to earn caps. While it is okay to do it in the beginning and in smaller rooms (or rooms with highly skilled workers), remember that the risk of a failed rush increases the larger the room is. 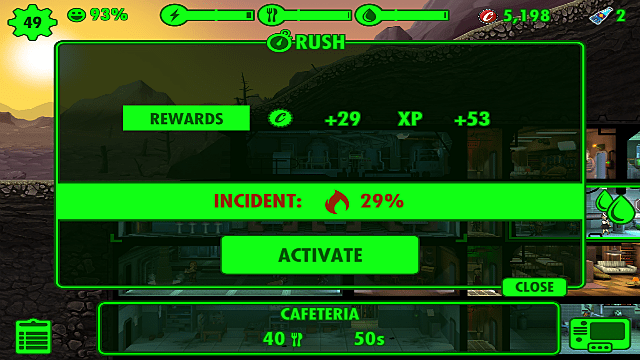 If the percentage is above 30%, I wouldn't risk it because I found that whenever I rushed a room above 30%, fires would break out -- which put a damper on the normal activities that earned me caps. 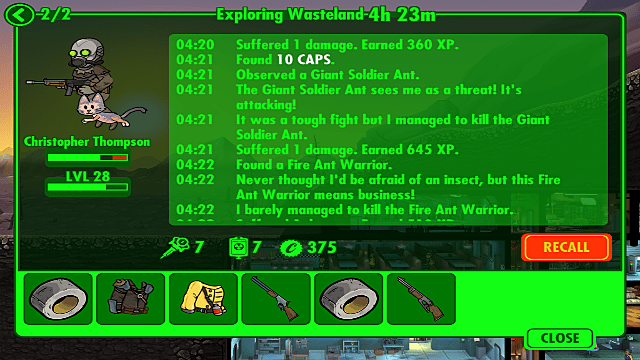 Are you sure that fighting the Giant Ant was 'tough', after you suffered only 1 damage and finished it off in less than a minute? 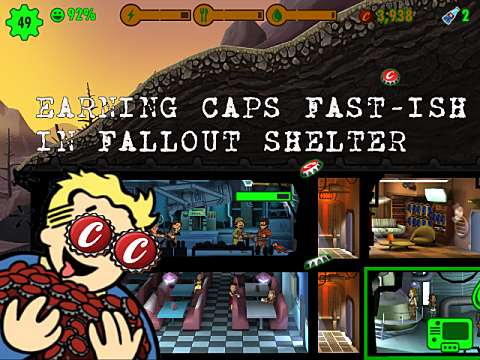 While I did send dwellers to the Wasteland when Fallout Shelter was first released, recent updates have made this an increasingly less reliable way to earn caps in terms of efficiency. Especially if it is your first time playing, sending a few dwellers out into the wasteland is a huge risk when they aren’t well equipped, aren’t at a decent level, or haven’t been loaded up with stimpaks or radaways. My second time playing, I was lucky enough to nab a level 25 dweller from a lunch pack, while my average dweller was only around level 3. That made wasteland exploration easier -- and the extra exploration allowed me to get my hands on more caps and loot. But I realize not everyone gets that lucky. When you do send a dweller out into the Wasteland with the intent of farming caps, make sure you send someone with a considerably high Luck stat (or outfit them with something that augments this stat). The Luck stat increases the chance of your dweller obtaining loot -- caps included. 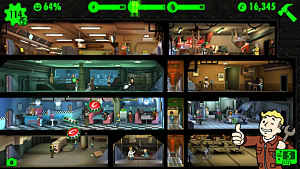 Once you have a certain amount of dwellers, you can raise dwellers' luck in the Game Room. Maxing this stat is beneficial for both quests and wasteland exploration. 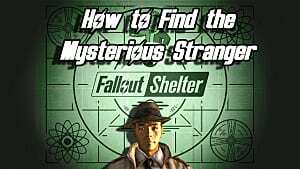 You can check out our full guide on the best stats for exploring the Wasteland in Fallout Shelter for more information. 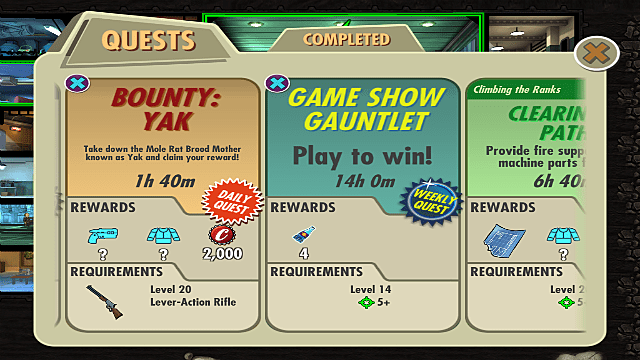 I've found quests to be extremely helpful in earning more caps -- and also got a considerable amount from discovering locations while dwellers were out in the Wasteland. Quite a few of the quests you can embark on reward a large amount of caps -- with a few of them offering well over 1,500. I've listed a few quests here that offer a large amount of caps, as well as the quest requirements. Farm these as often as you can (and repeat the ones you're able to) if you want to start racking up caps consistently. Be careful before undertaking any of these quests. Even if your dwellers are the required level for a certain quest, they still might not fare well. For example, I sent 3 dwellers over level 20 for a level 16 quest, but we still ended up losing and almost dead. You can also try doing the Game Show Gauntlet repeating quest to farm caps as well. Remember S.P.E.C.I.A.L? It's still important in Fallout Shelter. No matter what quest you undertake, keep in mind that levels aren’t the only factor in successfully completing quests. Quest combat is very different from combat incidents in the vault or in the Wasteland. It relies more on agility, strength, and endurance. Agility increases the dwellers attacks per second, endurance increases hit points, and strength affects your damage resistance. If you increase those stats, your dweller will fare better during quests. As a side note, it takes dwellers time to reach the quest location. If you have any Nuka-Cola Quantum, you can use them to reach the location immediately. I believe once you unlock the Overseer's office, you start with 10 Nuka-Cola Quantums. Some quests even reward them -- but I would use them sparingly so that you can save them up for more rewarding quests. 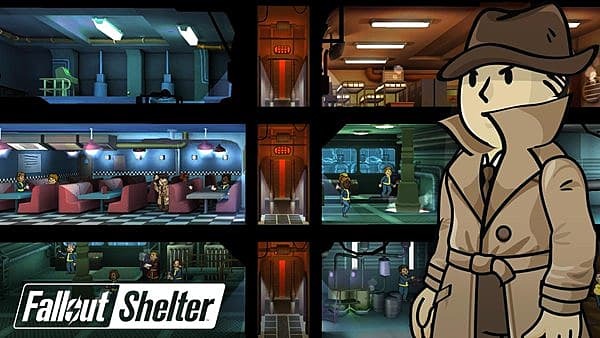 Besides raising your dwellers' Luck stats to earn more while exploring, you can get lucky while maintaining your vault when the Mysterious Stranger appears. Whenever he appears, his iconic music plays and you have a limited amount of time to find and click on him before he disappears. He can be hard to spot, especially if you have HD Zoom Out on. Once you turn that setting off, he's easier to find. The Mysterious Stranger seems to reward a random amount of caps every time you find him. Sometimes, my rewards for doing so would be as low as 100 caps -- but sometimes I would hit a jackpot of over 2,000 caps. He seemed to appear every 10-15 minutes when I had the app open, so I would recommend the Mysterious Stranger as a good way to get caps if you're trying to farm. You could even leave the app open and do other things, so long as you keep an ear out for the music that signals his appearance. He comes and goes like a ninja. I realize from other people's perspectives the methods above might not be the 'fastest' way to farm caps -- especially when you're just starting out with a new vault. But once you get a rhythm going, you'll earn caps faster. 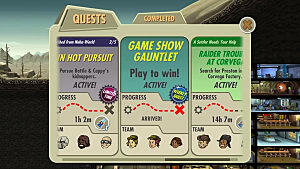 Just remember to level up, send dwellers out to the Wasteland, and complete quests or objectives. You'll be rolling in caps in no time. That wraps up this guide! 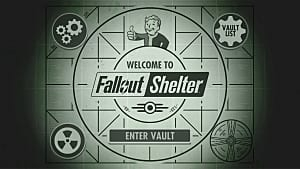 Check out the rest of our Fallout Shelter guides for even more tips that will keep your vault running smoothly.